Modified from Howarth, Schneider, and Swaney (1996), Caraco et al. (2000), and Strayer and Smith (2001). We know enough to assess the roles of benthic animals in the Hudson ecosystem only for the freshwater parts of the estuary, although there is no reason to doubt that they are important further downriver. Furthermore, because we have essentially no information about the meiofauna and mobile epifauna in the river, all of our assessments underestimate the importance of benthic animals in the Hudson. 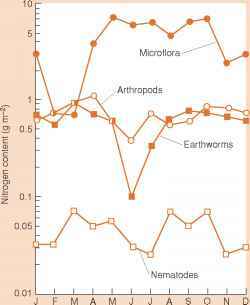 Most often, when ecologists speak of the "importance" of a group of organisms, they are referring vaguely to their abundance, biomass, or contribution to metabolic processes in the ecosystem. There are approximately 10,000 benthic animals/m2 of river bottom, and these animals constitute more than half of heterotrophic biomass in the ecosystem (e.g., Strayer et al., 1996). With the arrival of the zebra mussel, zoobenthic respiration changed from a minor term to a major term in the organic carbon budget of the Hudson (Table 19.3), which was large enough to significantly reduce dissolved oxygen concentrations in the freshwater tidal Hudson (Caraco et al., 2000). However, these conventional assessments give limited insight into the roles that benthic animals play in the Hudson River ecosystem. It maybe more useful to consider three specific roles that benthic animals play in the Hudson ecosystem: as suspension feeders, as forage for fish, and as sediment mixers. Suspension-feeders feed on particles that are suspended in the water column, and thus have the potential to affect the number and kind of phyto-plankton and other suspended particles. Prior to the arrival of the zebra mussel, benthic animals (chiefly unionid mussels) were responsible for a little more than half of suspension-feeding activity in the freshwater tidal Hudson (Fig. 19.5), and may have exercised modest control over plankton in the upper river (RKM 213-248) (Caraco et al., 1997, Strayer et al., 1994). After the zebra mussel invasion, the activity of benthic suspension-feeders became enormous, and was a primary control on the amount and kind of phytoplankton in the freshwater estuary (Caraco et al., 1997; Cole and Caraco, Chapter 9, this volume), with effects that ramified into many other parts of the ecosystem (Findlay et al., 1998; Pace et al., 1998; Strayer et al., 1999; 2001; Caraco etal., 2000).